click image for close-up Heading for Jamaica in 1781, the ship Zong was nearing the end of its voyage. It had been twelve weeks since it had sailed from the west African coast with its cargo of 417 slaves. Water was running out. Then, compounding the problem, there was an outbreak of disease. The ship's captain, reasoning that the slaves were going to die anyway, made a decision. In order to reduce the owner's losses he would throw overboard the slaves thought to be too sick to recover. The voyage was insured, but the insurance would not pay for sick slaves or even those killed by illness. However, it would cover slaves lost through drowning. The captain gave the order; 54 Africans were chained together, then thrown overboard. Another 78 were drowned over the next two days. By the time the ship had reached the Caribbean,132 persons had been murdered. When the ship returned to England the owners made their claim -- they wished to be compensated the full value for each slave lost. The claim might have been honored had if it had not been for former slave Equiano, then living in England, who learned of the tragedy and alerted an abolitionist friend of his. The case went to court. At first the jury ruled in favor of the ship's owners. Since it was permissible to kill animals for the safety of the ship, they decided, it was permissible to kill slaves for the same reason. The insurance company appealed, and the case was retried. This time the court decided that the Africans on board the ship were people. It was a landmark decision. On another voyage, on another ship, a similar incident occurred. On La Rodeur in 1812, there was an outbreak of ophthalmia, a disease that causes temporary blindness. 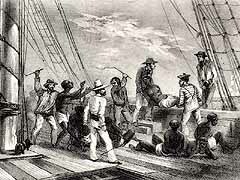 Both slaves and crew were afflicted. The captain, fearing that the blindness was permanent and knowing that blind slaves would be difficult if not impossible to sell, sent 39 slaves over the rails to their watery death. As with the captain of the Zong, he hoped that the insurance would cover the loss.